2017 was a fantastic year for many things, including accepting an assignment in Jordan as an international UN Volunteer Evaluation Specialist with the United Nations Development Programme (UNDP) Regional Bureau of Arab States (RBAS), where I support 18 country offices with their implementation of decentralized evaluations. It has always been my dream to step out and contribute to the greater agenda of sustainable development and to be able to support the world towards a better future. The decision to enroll in UNV’s pool of applicants allowed me to challenge the barriers women often face in Pakistan, which can prohibit us from pursuing our dreams of independently living and working abroad. Being a part of woman headed family, my mother encouraged me and stood by my decision, making sure that I am not alone throughout the process. 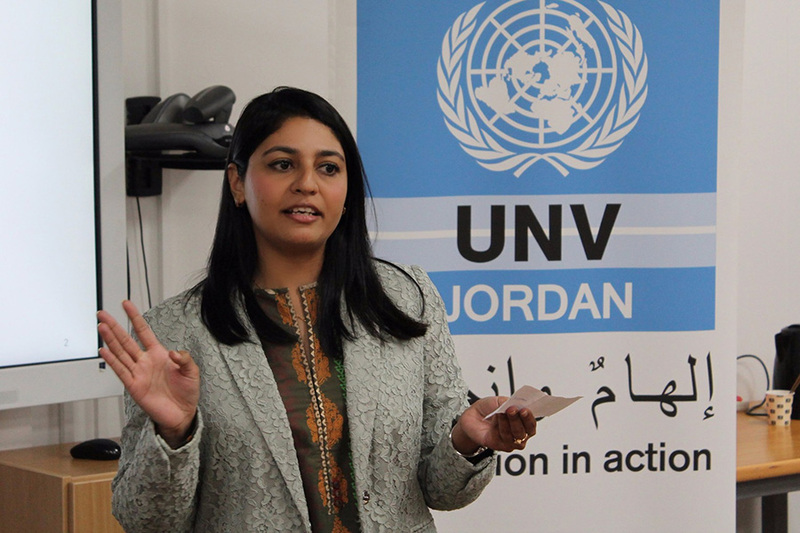 Serving as a UN Volunteer in Jordan is a means for me to set an example for women back home. My deployment as an international UN Volunteer Evaluation Specialist is a part of a joint initiative of the UNDP Bureau of Policy and Programme Support (BPPS), the UNDP Regional Bureau of Arab States (RBAS) and UNV. The initiative is part of a global project to strengthen UNDP’s regional and national capacities for monitoring and evaluation. UNDP places a lot of emphasis on implementing high quality programmes to enhance institutional effectiveness and to better achieve the Sustainable Development Goals. My assignment allows me to contribute to these incredible objectives. As part of this assignment, I support 18 country offices in the region on issues pertaining to implementation of decentralized evaluations, including review of terms of reference and updates in the Evaluation Resource Center (ERC). I provide recommendations towards the development of innovative approaches to strengthen country office’s decentralized programming and evaluation functions. The role of volunteerism in achieving the global targets for sustainable development is very important. Agreeing to serve as an international specialist not only gave me a platform to take a step forward to contribute for the SDGs but to gain further experience in the field of Result Based Management (RBM) and grow professionally. UNV has a Global Talent Pool where every year thousands of profiles get shortlisted on merit and matched with assignments offered by UN partner agencies. This is for me the most prestigious platform for young and experienced professionals around the world. National and international UN Volunteers in the Arab Region are playing an effective role in catering to a broad range of development solutions. From alleviating the impacts of conflict and instability, to increasing livelihoods for the refugees, to supporting political processes and bridging the continuing gaps and inequalities, UN Volunteers are making a difference. During my assignment, I was also given the chance to visit UNDP Headquarters in New York for hands-on training so that I may have a clearer understanding of the evaluation function at UNDP. I have also been honored to recently attend a National Conference on Evaluation Capacities organized by Independent Evaluation Office of UNDP in Istanbul, Turkey. Participation in such events, and continuous appreciation from my colleagues, has given me the confidence to contribute to leveraging evidence-based knowledge for development in the Arab Region through RBM practices.